The Western Conference has been building strength for years, so it’s no surprise that the race is tight. Los Angeles, Dallas and Phoenix all could get a bid for the postseason party. The Colorado Avalanche, The Calgary Flames and Edmonton Oilers bid adieu to the postseason and will be booking tee times later this week. Finally, the West can bring in new blood to represent emerging talent. The biggest success story is The Los Angeles Kings. A few weeks ago, the Kings looked lost and doomed down the stretch. Goaltender Jonathan Quick was not quick, but has his game back and could be the weapon of choice for the Kings. Anze Kopitar will get an opportunity to prove his worth as a top forward. Success comes from patience and persistence. St. Louis deserves to be the leading team in the West and should win the President’s Trophy. With top talent in Alex Pietrangelo, Kevin Shattenkirk on defense, and Captain David Backes at the helm, the Blues could win this whole shebang. With Jaroslav Halak and Brian Elliott making a dynamic goaltending duo, the odds are in The Blues favor. Hockey fans know Vancouver can deliver, but can drop at a moment’s notice. Consistency is the key for The Canucks and with Daniel Sedin out, and Kevin Bieksa, the remaining mates must muster more points. Kesler and Burrows have not produced much, so these two gotta get a groove going. Goaltending is world-class with Luongo and Schneider, but can’t carry the team. Or can they? Mike Richards and Jeff Carter reunion equals Stanley Cup bid. This was their goal in Philadelphia, so maybe the chemistry and drive is propelling the energy in the locker room. Dustin Brown, Justin Williams and Jarret Stoll have been Kings and would like this season to be the one. Chances are good for Los Angeles. They really spiked up the standings, and likely will make it to semifinals. Every hockey fan can get behind the program Barry Trotz has put together. Trotz is truly a hockey pioneer. The Predators have an awesome netminder in Pekka Rinne, who is Vezina worthy. Expect Nashville to do well, because the players have turned on the heat and are cohesive. Best chance this year for a conference final showdown. They’re fighters. No matter where Detroit is in the playoffs, they find a way to win. With a healthy crew, the Wings will fight until the end. Goaltending has been spotty. Offense has gone up against tough opposing goaltenders. Scoring must increase and Howard must be at the top of his game if Detroit wants to move on. The Chicago boys just hang in there. While they have a seemingly secure spot as the No. 5 seed, teams are chasing them. Chicago may be bumped. They play in a tough Central Division this season and sit just ahead of Columbus in the fourth slot. The Dallas Stars and The Phoenix Coyotes will fight to the death to get in. Dallas has done an outstanding job staying in the hunt. Dallas forward Michael Ryder has been a force to reckon with. The Coyotes have a solid goalie in Mike Smith. The outcome is boosting hockey in the Southwest for certain. The Pacific Division at this point is a 3-way tie. Expect some tenacious play in the next week for a guaranteed spot. Kicking off the holiday season, Chanukah starts tonight and the Christmas countdown has begun. Between your menorah lighting, your shopping panic and the family fun and frantic, the best gift to yourself is to take in some of the hockey highlights happening this week. New York Rangers at New Jersey Devils– Classic Hudson Valley rivalry as the Devils are on a four-game winning streak. The Blueshirts of Broadway have held their own, but King Henry has been iffy in goal lately. New York’s pesky agitator Sean Avery and Jersey’s rock-em-sock-em David Clarkson could bump into a brawl at some point. Great rivalry for the Eastern Conference and Atlantic Division. 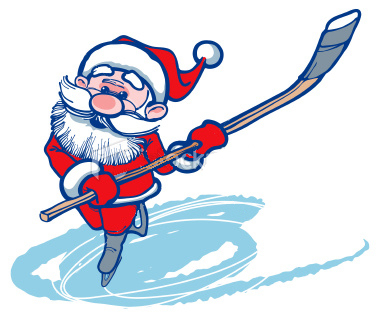 Detroit Red Wings at Vancouver Canucks– Nothing is like watching the Red Wings at Xmas time. Santa suits on ice. Vancouver oozes talent with the Sedins, Ryan Kesler and Alex Burrows. The Wings boast Pavel Datsyuk, Henrik Zetterberg and goalie Jimmy Howard. The list goes on and even Santa can’t keep up. Minnesota Wild at Edonton Oilers-Two of the hottest teams going with young talent at helm. Watch top draft picks Taylor Hall and Ryan Nugent-Hopkins host Dany Heatley and Kyle Brodziak. Both teams are currently on a four-game losing streak. Anaheim Ducks visit Los Angeles Kings– With plenty of talent, the Kings need to shake off their poor start and impress their new coach. The Ducks have weapons in Corey Perry and Ryan Getzlaf, but can they surpass the goaltending of the Kings Quick? If you’re up wrapping present, catch this SoCal battle. Philadelphia Flyers at the New York Rangers– Precursor to the Winter Classic. The teams are pumped, so this is a Friday night celebration. Flyers Jaromir Jagr, ex-Rangers captain returns to the Garden for a holiday shebang. Settle in and check your holiday lists or exchange your Chanukah gift. Los Angeles Kings visit San Jose Sharks- It’s the battle of SoCal vs. NoCal. Still wrapping and up late, check out this showcase of Sharks with Joe Thornton, Logan Couture and Dan Boyle as they blast their way to Hockeywood taking on Anze Kopitar and Jack Johnson. Get warm and toasty and snuggle in. No games on Christmas Eve or Christmas, but check your local listings for the week leading up to the Winter Classic on Jan. 2 when the New York Rangers travel to Philadelphia. It’s a tradition in Detroit to set the town ablaze during the Halloween weekend yet this year the only thing smoldering appears to be the slumping Red Wings. Ironically, fires over the weekend were down 50% just as the Wings have dropped their record. Now 5-4-0, the Red Wings signed defenseman Niklas Kronwall to a 7-year $33.25 million contract to keep the hits coming. Kronwall,30, is the heir apparent to seven-time Norris Trophy winner Nicklas Lidstrom. At the start of this seson, the Wings named Kronwall as an alternate captain emphasizing that Detroit’s blueline will remain tough as nails. Detroit’s woes are too early to create hysteria when all the pieces of the puzzle are still intact. Jimmy Howard’s latest performances have been horrific for fantasy owners the past week, but he’s still the mask to fear at Joe Louis Arena. Danny Cleary has been a ghost on the ice with only two assists and a minus-4 rating. Hank Zetterberg has only tallied three points, while Pavel Datsyuk has seven points and a minus-5 rating. Detroit fans are patient and waiting for their tricks to turn to treats. Don’t believer the hype that the Wings are crashing and burning or going down in flames. 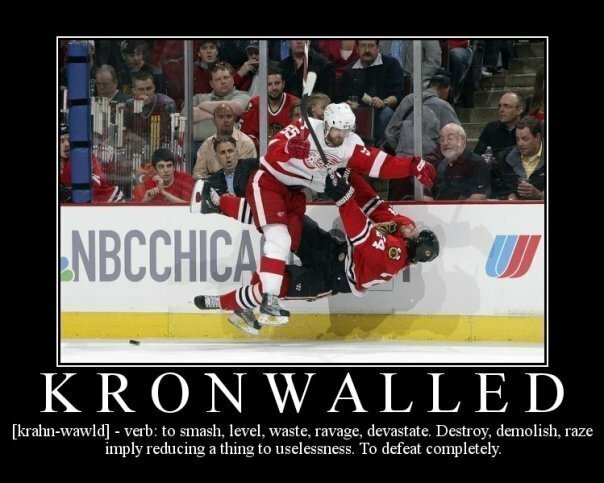 The scariest encounter in Detroit will be the pain inflicted by being Kronwalled. It’s only August and the hype has begun. After the woozying trades and trash, this summer read like more like a gossip column. Mike Richards and Jeff Carter were expelled from Philly for bad behavior, LA Kings GM Dean Lombardi was irked when he was traded damaged goods by Edmonton, and just recently Sean Avery was busted by the cops in Hollywood for shoving an officer. If you are sitting by the pool, then you have plenty of time to begin building your fantasy team. Whether you play in a competitive keeper league or drafting an entirely new team, consider the teams who have revamped their lines. However, buyer beware that not all top players perform as well as expected. Duncan Keith’s award-winning 2009-10 season did not carry the same weight in 2010-11. Sidney Crosby’s health is tenuous- one big hit and he could blowout. New York Rangers- resigning Brandon Dubinsky and Ryan Callahan were crucial. Both players have developed their game and are the workhorses of the team. With Brad Richards joining the mix, the Rangers will be a fun team to watch and get behind. With Avery and Brandon Prust, expect some tough guy presence stopping any intruders near Henrik Lundqvist‘s crease. Philadelphia Flyers– sign Jaromir Jagr. Who knows what to expect? He could be great or gruesome, but you don’t want to be left behind on this one. He snubbed other teams to join the Flyers because of their Cup contention coup. Max Talbot, Claude Giroux and a roster full of hot taletn can be yours if you do your bidding carefully. Buffalo Sabres- coach Lindy Ruff is still calling the shots on ice, and with newly acquired talents look out. In net, Ryan Miller is one of the best in the NHL. Christian Ehrhoff and Robyn Regehr will lend the blueline some direction helping Tyler Myers this season. Carolina Hurricanes– Jeff Skinner and Anthony Stewart are just two young players to watch in Carolina. Skinner, who won the Calder for rookie of the year, is first line, Stewart 3rd or 4th. Other young talent, Jamie McBain and Chad LaRose need to go on a watch list. Tampa Bay Lightning– re-signing Steven Stamkos was a necessary requirement before GM Steve Yzerman could go golfing. With Stamkos secured, the Bolts will be out for blood this year. Vinnie Lecavalier and Marty St. Louis may be already drafted, so consider Ryan Malone and Teddy Purcell for a stong support system. Pittsburgh Penguins- with or without Sidney Crosby, the Pens put the pedal to the metal. All energy, all the time. Kris Letang should be on your list. Tyler Kennedy rocked last year and must be a consideration, same for Chris Kunitz and James Neal. Boston Bruins– I’d sweep up Dennis Seidenberg. Tim Thomas is an obvious choice, but secured by keeper leagues. If the Stanley Cup win was it, then don’t go overboard with the Bruins. However, there are some good bets here in Rich Peverley, Patrice Bergeron, don’t forget Brad Marchand. I’ve found Shawn Thornton, Andrew Ferrence to be good for fights and scruffy play. Milan Lucic and David Krejci have inconsistent seasons but make good trade fodder. Los Angeles Kings- has a great building process in Hockeywood. Anze Kopitar will be ready come ice time, and with Mike Richards as the extra kick, look out! Jack Johnson and Drew Doughty are key defensemen. Jonathan Quick in goal is a great pick. Captain Dustin Brown didn’t let me down. Justin Williams was the sought after Kings player in our league rightly so. Detroit Red Wings– always on the list due to the talent they foster. Henrik Zetterberg, Pavel Datsyuk and Nick Lidstrom are tops on any list if you can get them. Goaltender Jimmy Howard may be a task to acquire but worth if you can make a trade after the season starts- sell low. Johan Franzen and defensemen Niklas Kronwall should be noted for scoring and hits. Vancouver Canucks– they just couldn’t wrap it up, but that has been their issue. Lessons learned may help Ryan Kesler and the Sedins in creative ways to win. Consider Alex Burrows, Kevin Bieksa and don’t be wary of goalie Roberto Luongo if you can get him. Edmonton Oilers– I say this because the whole world will be watching the Taylor Hall/Ryan Nugent-Hopkins dynamic. Grab either player and be patient. Hall took some time to warm up and was passed all over fantasy leagues as owners became restless with his growing pains. Chicago Blackhawks– “Car Bomb”Carcillo will explode in Chicago enforcing the Hawks second revival. This is a tough team who wants the Cup badly. Patrick Sharp is signed and you should do the same. He’s a quiet player who has his ups and downs, but delivers overall. If you can acquire Patrick Kane of Jonathan Toews, then work your magic. Andrew Brunette is a watch list candidate to see if he can generate something. St. Louis Blues– I pick them every year due to the talent that passes through. Chris Stewart stands out for the Blues. David Backes is a sturdy candidate but can be unpredictable. Kevin Shattenkirk,Alex Steen and Andy McDonald did well last season and are good choices in the second to third-round. Remember to put Alex Pietrangelo on your list as a stellar young defenseman, and keep an eye on Matt D’Agostini. Logan Couture (San Jose Sharks)– The Sharks can beat the Detroit Red Wings in the playoffs, but can’t seem to get further than that. Couture was nominated for the rookie of the year and deservedly so. Grab him before someone else does. Usually a second-round pick now that he’s on the radar. Jamie Benn (Dallas Stars)– Benn broke out last year and was quite dutiful to fantasy owners. If he lands in your queue, consider if you need a productive 3rd liner. Devin Setoguchi (Minnesota Wild) – great during the playoffs with the Sharks. Minnesota has been on everyone’s radar to be big but remains in the middle. Perhaps Setoguchi can spark some oomph. Your dream team is in your hands. Not all goes as according to plan and your backup choices can make the difference in all areas from trades to suspensions of a key player. Study the new and improved rosters if you haven’t been keeping up with the transactions this summer. It’s the end of July and hockey topics are thin at best. Numbers crunch, save percentages waged and other pertinent stats hit the street to make light of some hockey news, any hockey news at all. Thus we come to the new debate formulated by those stat geeks who can’t stop picking at the numbers. I like the stat geeks. I enjoy their mathematical brain and revel in their statistical evaluation of key players and future Hall of Famers. Apparently, Detroit’s Chris Osgood is the most recent target of the fame or lame game. Chris Osgood has expressed his interest in hanging out at Tigers games, and he will get his wish retiring from the NHL this month. Osgood played only 11 games last season for Detroit being sidelined after undergoing sports hernia surgery in January. Osgood has 401 wins in his career which is the 10th best in the league ever. Osgood’s netminding spanned 14 seasons, and he earned three Stanley Cups. Not bad. The issue is his clutch, particularly in the crucial Game 7s where Osgood’s record is 2-4 in six games, and his save percentage just .901. “Ozzie” is being passed off as an average goaltender hiding behind one of the best teams in the league. So. Most Hockeytown nuts are aware of that. He’s being considered because it is not an easy job to mind the pipes for the Wings. They win, so does the goaltender. A few articles have expressed dismay at the Ozzie hype and his Hall of Fame candidacy. When Ozzie was in net, the Wings delivered a .629 win percentage and an improved .640 when he was not in goal. It doesn’t matter. Osgood stood in goal and backed the Wings through playoffs and Stanley Cup victories. He’s worthy of being looked at because he was the goaltender for one of the best teams in the league. This is a consideration and there has been no guarantee made for Osgood to make the Hall of Fame. Netminder needs keep Joey MacDonald at Joe Louis Arena in the No. 3 spot. Not so spectacular, but it will have to do. The likelihood of McDonald seeing ice time will be minimal. The Red Wings turn out phenomenal talent, but are the goaltenders hiding behind the team? Could the weakest link of the Wings be behind the mask? Detroit signed Howard to a two-year deal in February and will stay put for now. At least the deal was limited and not an extensive contract like that of Roberto Luongo’s 12-year, $64 million deal. Jimmy Howard has become legend in fantasy hockey leagues, yet many Wings fans are ambivalent on his work ethic and his abilities in general. Ty Conklin signed a 1-year deal as backup for Howard. Conklin is no stranger to the Wings playing in 2008-09, going 25-11-2 with a 2.51 GAA. Conklin had 37 starts and 40 games with Detroit three seasons ago, which were both career highs. He has only appeared in two career playoff games, neither as a starter. Goaltending hasn’t been a huge priority for the Red Wings because the emphasis has always been the blueline and production line. Datsyuk, Zetterberg and Franzen will again step into the powerhouse roles, and Jimmy Howard will dazzle or dwindle. The NHL is doing great. As a corporation, the profits and media coverage sit at some of the highest levels in years. With the Winter classic tradition and the jump in viewing numbers for the Stanley Cup playoffs, hockey is doing well in the US. The Hockey News even sported a daring cover recently posing the question- is hockey dying in Canada? Could this be the beginning of an end of hockey dominance? Sidney Crosby and the Winter Classic was the NHL’s love affair with Crosby. Then Ovechkin is the bad guy in this scenario. Pittsburgh has taken dominance in the hockey world with the likes of the Red Wings and the Rangers. The Capitals are a fantastically talented team with Ovi at the helm. Have they just begun to play with the expectation that they are destined to win the Cup? Entitlement is dangerous territory. Complacency. Ovechkin may just like the other attention he is getting. This may be the year of the Crosby-Stamkos rivalry. Future Winter Classics coming to a beach near you. Let’s talk the Los Angeles Kings. Captain Dustin Brown has made me a believer in his skills. Then take some Jack Johnson, Anze Kopitar shake it all up and you produce. The talent doesn’t stop there. After the Gretzky project, the Kings fell from grace but have been jolted alive by talented lines at every turn. Quick wears the name well. Lots of hype in LA at the start of the season and the love shows. How about those St. Louis Blues and the Steenster? Making the playoffs would be a real kick for all those underdog teams. Please Lou, fix the New Jersey Devils. I can help. When I get to the Shore, I’ll give you a call. The New York Rangers are back on Broadway as the stars. With Ryan Callahan out, the Rangers have a major player in Brandon Dubinsky- he can fight, score and just carry the swagger of the Blueshirts. Avery is sporting a new and improved image and throwing down like old times. Brandon Prust has awed with varied talent from assists to roughing. King Henry rocks as usual. It’s been a good year for the New York Rangers. Detroit has some special young talent who are taking their role as a Red Wing seriously. Patrick Eaves is dishing out the goods with a hat-trick. Eaves knows how to win with his dad coaching up in Wisconsin and all. Justin Abdelkader is a Michigan boy, and every kid in Michigan idolized the Wings. He absorbed it all throughout his childhood. Jimmy Howard has raised the bar for goaltenders. Young but well trained, the role of the goaltender has been destabilized by the show of success between the net. One day you’re in and the other you’re out. Howard is so in and will be until a puck decides his fate. Wings are soaring again. The Ryans have struggled this year and it is surprising after a great USA Olympic run for the Silver. The show must go on even for Ryan Kesler in Vancouver and Ryan Miller in Buffalo. Spotty and soaked at times, the inconsistency has me worried. Let’s look to 2011 to be an outstanding year for the NHL and hockey in America. Stanley Cup predictions aside, the San Jose Sharks and Washington Capitals may have reached their peak. The Flyers and Wings could be winners in the race for the Cup. The Red Wings will not go away despite the hope of many teams, including the Anaehim Ducks. Brawls came often to the crowd’s content, because no one comes into Joe Louis Arena without a fight. Too bad dungeon master Abdelkader is out with injuries. He would have loved this game. Wings wowed the crowd in the first few minute of the season opener against the Anaheim Ducks. Johan Franzen and Mike Modano led the Wings early. Johan Franzen’s goal came from a set up from Filppula and Bertuzzi. Modano’s goal seemed effortless and slid the game to a scruff between Ryan Getzlaf and Tomas Holmstrom. The Captain of the Anaheim Ducks continued talk after reaching the bench, and winger Holmstrom was happy to talk back. With the lead, the Wings continued to play nabbing another goal in the second by Pavel Datsyuk with an assist from Henrik Zetterberg. Praise the Red Wings. Anaheim’s Jonas Hiller got shot down by the Wings momentum. Holmstrom received a 10-minute misconduct as did Corey Perry. Roughing dominating the middle of the game as it should be to gain advantage the Hockeytown way. Datsyuk even threw some punches but no punishment. In a late period goal review, Cleary was able to get a season-opener to start the year from an assist from Datsyuk. Up 4-0, the Wings hit it hard with Datsyuk getting some good punches in with Corey Perry. Overall, the game tallied 30 minuts of misconduct calls,15 for fighting and 10 for roughing. Teams, don’t come to the Joe without your boxing gloves. Wings win with a Jimmy Howard shutout. Packing up and heading to the Windy City, The Wings were the guests for the Hawks opening night. The game had quite a quiet first, until The Red Wings got things going with a nice combo by Bertuzzi, Franzen and Filppula, rousing a few boos from the Hawks crowd as Detroit scored first. Hossa had to spoil the fun and stuck it to the Wings with one in net to tie. After the break, Bertuzzi, Stuart and Rafalski told the Hawks they were not going away and scored another for the away team. Then Chicago retaliated with a goal from Bryan Bickell. Going into the third, the battle was won by a hard-core goal by Filppula, who will be one of my fantasy picks for the week. But just wait….it’s Filppula with a power-play goal. Hudler knocked out an assist to get back into the Wings groove again. Looks to be a great season. Red Wings fans are in mourning. It’s not just a hockey game; it’s out existence. Detroit isn’t really known for our football, a tad for our baseball, but moreover the depressive state of our city. Detroit was named the murder capital for numerous years, but that had been replaced with the title of Stanley Cup champs. So now what do we do? If you’ve never been to Detroit, you’ll be taken aback by the ghostly streets and boarded up buildings. When you walk from the Ren Cen to Joe Louis Arena, it reminds you of a movie set. Some great horror and actions films could be filmed there immediately. Detroit’s own Mitch Albom, Jeff Daniels and others have talked about refurbishing the city into Hollywood East. Detroit has one of the best art museums, some great Greek and Middle Eastern food, and Canada just over the border. But what the Red Wings fans will do now is go boating, hit one of the many beaches and sing Kid Rock songs all summer long. The series between San Jose and most likely Chicago will be a good one, but I’m looking to the Eastern Conference. If I can’t see the Canucks move on, I’m supporting my Boston Bruins friends. I’m also supporting Zdeno Chara. Boston has done a remarkable job making the playoffs and taking control over the Flyers. Pittsburgh was always one of my favorite teams, until last year when the Pens snubbed the Wings at the Stanley Cup celebration. Good sportsmanship is still one aspect I admire in a team. I can make a case for the Canadiens, who are the Cinderella team in the playoffs, but my Boston friends will not have that. The good news for the Wings is that Jiri Hudler will return, there are plans for a new arena, and Jimmy Howard will be an attack dog next year. I’m watching hockey for the love of the game and the playoff run. The big question is whether the Detroit Red Wings can pull off the upset and work there way into the playoffs past the Calgary Flames and the Nashville Predators.But the Wings lost to the Flames 4-2, but were able to beat the Buffalo Sabres in OT, 3-2. Then the clincher came beating the Flames Monday night 2-1.Will the Wings maintain the momentum and give Motown something to cheer about? The Wings have gone to the Stanley Cup finals the last two seasons. Twenty continuous years in the playoffs is not an option for the Red Wings.They lost last year to the Penguins and won the season before that to those same Penguins. So who’s to blame for this rumpling of the hockey feathers? Two stars, Henrik Zetterberg and Pavel Datsyuk haven’t had the scoring seasons they have had in the past. Zetterberg has clocked 19 goals as opposed to his 31 last season.His assists reign with 38. Datsyuk has tallied 22 goals this year, while he had 32 last year.He also is doing well in the assist category with 36.But these guys were not signed on to be assist leader.Datsyuk has had a scoring run lately and has been revived- since March 1st, he’s scored three goals, and four assists. He scored six points in February. No one can dispute the loss of Johan Franzen during most of the season due to injury.He’s had seven goals this year, while captain Nicklas Lidstrom has eight.But what happened to the confident spark of the Wings? Hossa, Hudler and Samuelsson evidently made more of an impact than originally thought.It’s like a Frankenstein created with all the best parts, but something went awry in the process.A few limbs were lost.The team clicked but it cost too much to maintain.Bargains are not always the best buys. So who’s stepping up?Let’s talk Tomas Holmstrom with 20 goals, 13 assists and the gung-ho attitude expected of the boys playing on the ice at Joe Louis Arena. His late goal against the Calgary Flames burst the Wings into the eighth bunk in the Western Conference. No one can debate the excellence of play in net for rookie Jimmy Howard, a Calder Cup candidate.But he may need more of a break.There is a huge debate in the Motor City on the Howard-Osgood goalie controversy. With three Stanley Cups, 396 career wins and a 16-year career in the NHL goaltender Chris Osgood has been sitting, while Jimmy Howard exhausts his play in net.Remember last year when Ty Conklin was the hero going into the playoffs?The fans turned on Ozzie because of some downed games, but they were singing his praise as the Stanley Cup was in sight.Red Wings fans still love Ozzie. Maybe there is no magic formula but the Wings have had the magic touch for years, making them one of the most despised teams in the NHL.Losing isn’t an option for the Wings and they will fight to the end to earn a chance to redeem their valor. This is the last thought that any Red Wing fan has at this time. With the Western Conference standings bouncing around, the Detroit Red Wings could climb. Sitting in the nine spot isn’t where the Wings or anyone thought they’d be. Amazing, yet perplexing is the continual attempt of the players to hang on to the reputation of the team. Justin Abdelkader has that McCarty fist, Jimmy Howard has found his legs, and the stars are rising over the Detroit River, for now. Power forwards Pavel Datsyuk and Henrik Zetterberg have not been on par this year. Matter of fact, they’ve just disappointed. Both have contributed a combined 22 goals, 45 assists that should equal one average forward. Fantasy league owners are miffed. Formulas for improvement haven’t accrued, yet. So how long do these two need to wait and condition to get their mojo back? Right now, the outlook is to sneak into the playoffs and go from there. The original first line with Lidstrom, Rafalski, and Cleary has stood up to the test just not quite getting the grades they should. Injuries have plagued the Red Wings. Franzen, Filppula, Holmstrom, Kronwall, and a rotating door of various key players have created buzz over the impact the AHL has and its infiltration of players that are standing out. Justin Abdelkader has taken some limelight defending his big brother team with a decent 6 points and an impressive 31 penalty points, which adds up to a few fights along the way. Returning to the line-up is Valtteri Filppula, who was striking gold before his stint on IR. His promise of the breakout candidate hasn’t been able to break out of the gate in the confines of 3 goals and 7 assists. Minor league players can fly or faint. Detroit doesn’t rush breaking in the rookies, rather growing maturity and experience. Thus is the case of Jimmy Howard. Spending the past few seasons with the Grand Rapid Griffins, there was much hype about the Red Wing rookie. It looked dim for Howard in the beginning, and veteran Chris Osgood performed well until the Zen knocked down Osgood’s stature. Osgood had the same problem last year. Last March, fans I talked to at the local bars in Detroit hid behind Osgood’s stroke of back luck and supported then goalie Ty Conklin. Anything to win no matter who’s tending the net. Now, over the mid-season hump, Howard has proven his ability to perform to the expectations of being a Red Wing. Weary Howard fans sing his praise but know Osgood may be back if Howard falters. And that’s what happened last season meandering into the playoffs; Conklin sank and Osgood swooped in to save the day. Not performing goaltending duties since December 20th, Osgood stood in for the bombarded Howard on Long Island Tuesday. The loss still came with a blow. The early season prediction in the Sporting News rated the Red Wings as holding steady. “Despite some cost-cutting, Wings still look like best in West thanks to young gun,” read the headline on the Wings page. Young guns indeed, holding steady evolved into holding together with the glue kind of steady- sometimes it holds, other times not at all. Just as the Avalanche forecasters said the Avs would drop, the crystal ball for Detroit is that the team will always climb. Puck Daddy has glazed over the Wings waning season. The young guns weren’t dying out there on the ice, but keeping it respectable until the 6-0-shutout loss to the New York Islanders. Yes, it’s an Isolated game that did not revive despite a 4-1 win over San Jose and a 2-1 victory over one bump up in the standings, Los Angeles Kings. Stop the bleeding or get off the roller coaster. Something’s gotta give. Franzen, “the Mule” needs to save us from our imprisonment of malaise. Ericsson will play wandering defense just to get into the thick of the game. The bench may be too timid to play with the big boys or they’re just not jiving. With the Olympics around the corner, the season will roll into serious contention for playoff spots that will be torn apart and broken through to the other side. It could get vicious. Let’s hope so for Detroit’s sake that Johan Franzen is the savior and can revive faith in what was to be. Is there panic in Detroit? How about praise? Talk last season took on teams taking a dive for the highest draft pick. No one has suggested that of any team yet. Not only insulting to the players and the game, hockey in Motown is taken seriously and no joking about that stuff. If the ship were already sinking perhaps draft order would be of interest. Haven’t arrived at that dilemma yet. Recharged, retooled, rerouting takes the course of action to instill forging ahead not abandoning the cause. Let your Red Wings flag fly!